The Gate at the Primary School commemorate those from Dartmoor and North Dartmoor who served in World War One. DRIK DRIK, Saturday. — "Back to Dartmoor" celebrations opened yesterday with a "back to school." There was a large attendance of local and former residents. Inclement weather somewhat marred the day. A welcome was given by Mr. Fink, head teacher, and Mr. Scholfield, M.P., opened the celebrations. The roll call and "back to school" sessions were led by ex-teachers, including Mr. Bond, M.L.A. Mr. George Greenham received a presentation for the oldest boy present, and Mrs. E. Dowling for the oldest girl. 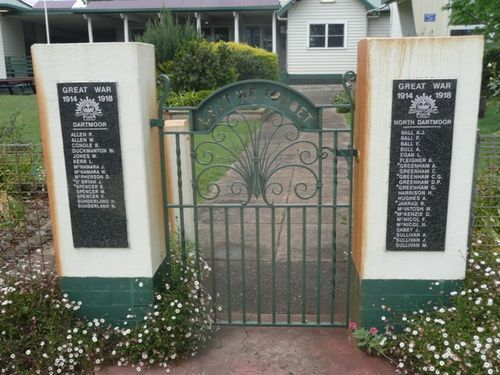 Mr. J. Richards, district inspector, performed the opening of the soldiers' memorial gate and unveiling of the honor roll, erected with funds subscribed by old scholars. Calisthenics by members of the girls' gymnasium, maypole by junior and senior ' girls, school games and community singing were items of interest. Prizes were awarded to Miss Cook for best-dressed girl, Mr. P. Allen for best-dressed boy, and Mrs. G. Kerr, best excuse for absence. Age (Melbourne), 18 November 1935.